eFACiLiTY for an Iconic Residential Campus of a leading Global Defense, Security and Aerospace Company! eFACiLiTY® for an Iconic Residential Campus of a leading Global Defense, Security and Aerospace Company! The client was a global defense, security and aerospace company, delivering a full range of products and services for air, land and naval forces, as well as advanced electronics, security, information technology solutions and customer support services. The client was looking to have an integrated portal that supports in managing all its facilities operations. The residential campus based in Middle East is designed to provide foreseeable accommodation needs for expatriate employees. 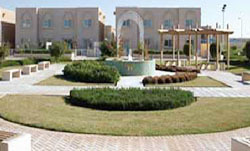 The campus encompasses restaurants, club houses, sports facilities, auditorium, shops and medical facilities. It was a challenge to streamline the operations and deal with an extensive volume of data – possibly incalculable reports, manual intervention and correspondence things. The client chose to implement eFACiLiTY® – Enterprise Facilities Management Suite that comprises of all possible facilities management modules like Asset / Maintenance Management, Helpdesk and Knowledgebase, Facilities Booking / Reservation System, Tenant Billing System, etc. eFACiLiTY® was implemented that provides Facilities Management Services to the residential campus. The eFACiLiTY® – Asset / Maintenance Management module manages all the assets present in all their Villas, tracks their warranty / AMC contract details, their maintenance schedules, costs & budgets, break–down history, inventory related to the assets and their purchase orders, etc. The periodic maintenance work orders are auto–generated by the system reducing the planning requirement. The system also tracks the cost & labor involved, spares / tools required scheduling. The security of such a facility is paramount and so eFACiLiTY® – Visitor Management System module ensures security. Visitors are screened, registered, signed in quickly and allowed to visit only the relevant areas via integration with access control devices. The registration and authorization process are generally time consuming and this module provides various features like request for appointments, approval and pre-registration, group registration etc. The eFACiLiTY® – Helpdesk and Knowledgebase module manages all the services requests and calls received, assigns it to the helpdesk operators / team to acknowledge and take necessary actions, raise work orders for solving any issues, gather feedback on completion of the request, etc. in a seamless manner ensuring Residents delight. The eFACiLiTY® – Facility Booking System is used by the residents to book / reserve club houses, sports facilities, auditorium, swimming pool, guest rooms, etc. The residents are billed at the end of month via eFACiLiTY® – Tenant Billing System. The Client is at ease of managing its complicated flow of information and communication. The benefits of using eFACiLiTY® are best performance and operations, interoperability, increased level of efficiency and effectiveness in tenant satisfaction, which are today's global demands.